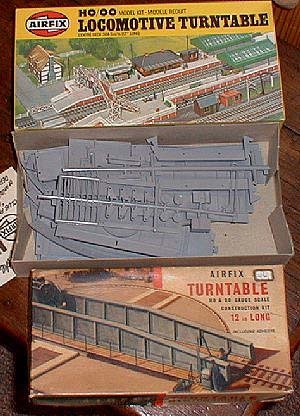 The Airfix Turntable has been specially designed to fit in with any "00" or "H0" gauge model railway layout and to be used with any 16.5mm. scale or proprietary track. The centre deck has a span of 12 inches and will accept any standard model locomotive. The kit consists of 54 parts and includes stanchions, circular guide rail and bogie wheels and control cabin. It can be adapted for manual operation with cogs and gears or made fully automatic.